What will happen to cells placed in salt water? You might have some initial ideas, but we can actually observe what happens by looking at the cells of an elodea plant under the microscope. You will prepare two slides, one will have the leaf in its normal water and the second will have a leaf that has been soaked for a few minutes in salt water. 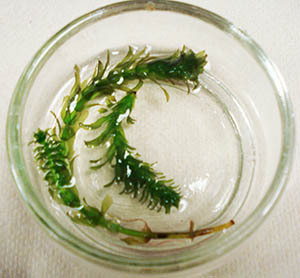 1) Obtain two leaves from an elodea plant that is grown in aquarium water. 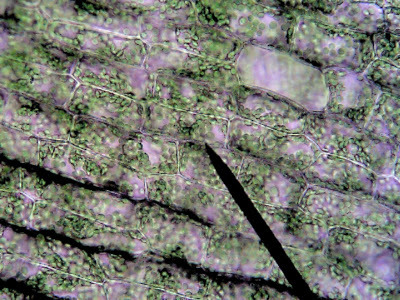 Place one of the leaves on a slide and observe the cells under a microscope. You should be able to identify the chloroplasts and an empty space in the middle of the cells which is the vacuole. 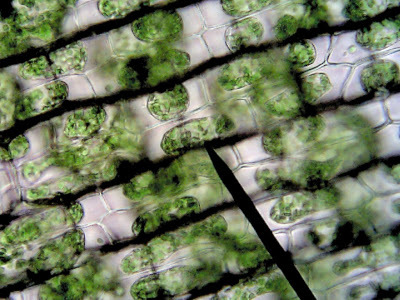 2) Soak the other leaf in a salt water solution and observe the cells under the microscope. Compare the cells to the first slide. Sketch your slides, showing how the cells appeared in each solution. What happened to the cells soaked in salt water? Consider what would happen to an entire plant soaked in salt water? What do you think that would look like? NGSS recommends using anchoring phenomena as part of a larger unit. Instead of labs being performed to show students what is expected, students are instead given the opportunity to explore a phenomenon and raise their own questions. They are not expected to know why this happens, but as the unit on cell transport progresses, they will eventually be able to pose their own explanation for why the elodea cells changed. I don't usually give them this handout, and just write directions and discussion questions on the board. The photos below are shown again later to remind students what changed, and also as they look at the slides because my beginner students are still mastering use of the microscope. Images of elodea Cells in an isotonic solution (fresh water) and in a hypertonic solution (salt water). Notes: Most students will understand that salt will cause the cell to shrink, what is surprising is that the cell itself does not get smaller, but the vacuole gets smaller. Chloroplasts that were found near the edge of the cell wall will collapse into the center of the cell because the vacuole is empty.